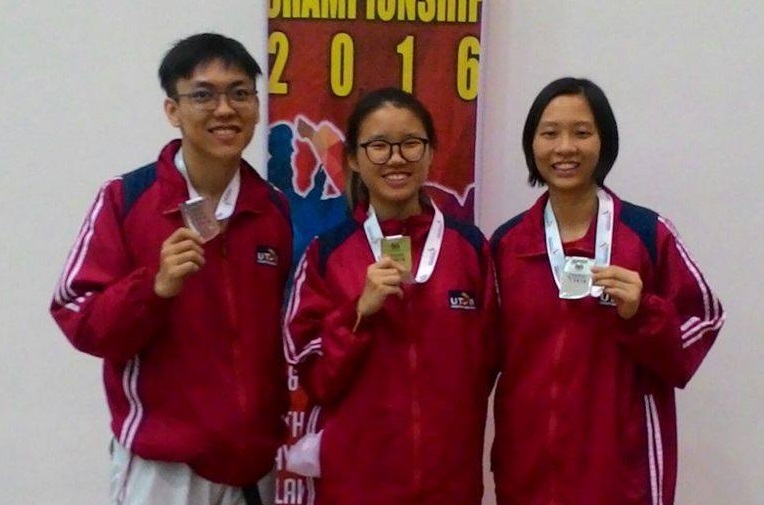 Quantity Surveying student Tan Pei Lin, International Business student Choong Poh Yee, and Building and Property Management student Kong Wai Jian took home a Gold, Silver, and Bronze medal respectively at the 3rd Majlis Sukan IPTS Malaysia (MASISWA) – Taylor’s Taekwondo Championship 2016 held at Taylor’s University Lakeside Campus on 4 and 5 November 2016. “Their overall performance was better than the past year, although the number of medals decreased compared to last year​. The winners will also get a chance to be selected to represent Malaysia in the upcoming ASEAN University Games (AUG),” said Department of Student Affairs (Sungai Long Campus) Sports and Recreation Unit’s Ganavenoth Karunakaran. Bronze medallist Kong said he was happy to be able to maintain his performance and promised to train harder, especially for next year’s Sukan Institusi Pendidikan Tinggi (SUKIPT) games. Over 25 private universities and colleges took part in this competition. This championship was organised by MASISWA.